Call 305.989.8433 to order today! Operating under new principles of underwater propulsion, the Pegasus is a highly reliable, safe and cost effective solution to diver assistance. With a dry weight of less than twelve pounds and a five pound negative buoyancy, this unit has the highest thrust to weight ratio in its class. 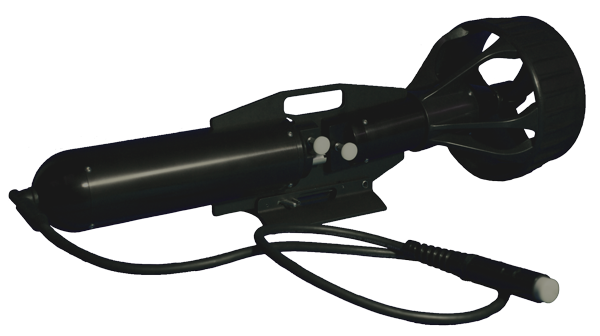 The Pegasus provides divers with a comfortable and easy option for underwater maneuvering. The Pegasus is the optimal solution for recreational, professional and military personnel. Backed by an unprecedented one-year unconditional Warantee, the Pegasus means only one thing, rugged simplicity! The Pegasus underwater propulsion system is designed specifically by scuba divers for scuba divers. Several years of research and development have created a highly reliable and user friendly propulsion system unlike any in the market. No hassles, Easy assembly! From the time the system is removed from the travel hard case until you are finished, the Pegasus provides complete confidence in underwater recreation, safety and rescue. Why? Because by adding the Pegasus propulsion system to your dive equipment you will; (1) extend your dive time by consuming less oxygen (30% - 40%), (2) allow your hands to operate equipment (camera, spear, light) , (3) cover more territory and (4) ease your struggle with currents. By simply moving your head and body, the Pegasus maneuvers like "Wings in the Water". *results may vary due to diver size, weight, etc. Total Shipping Weight for Pegasus Thruster and Pelican Case is 34lbs. Total Shipping Weight for Pegasus Thruster and Seahorse Case is 29lbs.